Two of Norm Ullman's milestone NHL sticks: his 200th goal stick (top) from November 18, 1964 (the year he led the league in goals with 42): and his 350th goal stick from the 1968-69 season. 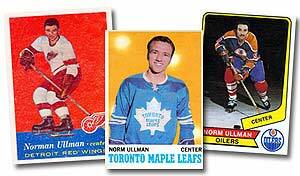 Three hockey cards that span the distinguished career of Norm Ullman (from left to right): his 1957-58 Topps rookie card as a Red Wing: his 1970-71 O-Pee-Chee card as a Maple Leaf; and his 1976-77 final O-Pee-Chee WHA card as an Edmonton Oiler. 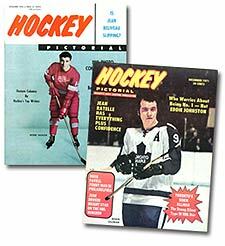 Three decades in the spotlight - Norm Ullman on the cover of the December, 1958 and 1971 Hockey Pictorial magazines. 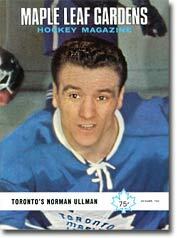 A 1970-71 Dad's Cookie hockey card of Norm Ullman donning an NHL Players Association jersey.